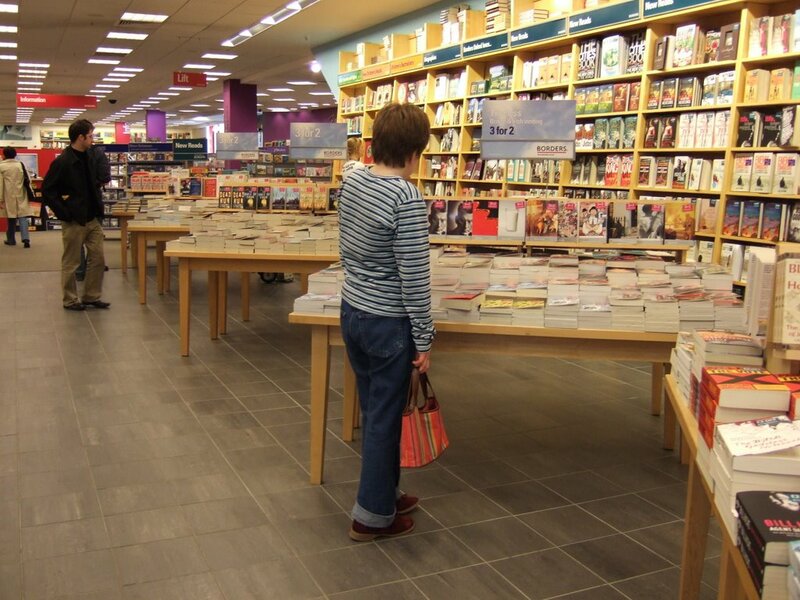 Do you know why these bookshops have closed? 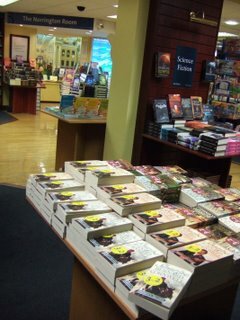 Re the tables: personally I'd buy more books if they had full reviews of the titles on display. Then I could make an informed choice in the shop. £26? I thought you weren't going to buy any books until you opened? Muffins? Spying on big stores' fixtures is problematic because these big companies have problems a small shop doesn't. For instance you could assemble a completely mismatched array of miscellaneous furniture obtained in a flea market and repurpose these objets-de-kitsch for purpose of book display. No big fancy store has this option/opportunity! However, where stock selection is concerned, spying is absolutely essential, and the big stores are the place to go. Bring a tiny notebook, spend days and days copying ISBN numbers off of books they carry which you think you'd do well with. The secret is to ignore the big front table displays. Go into the sections, where they've got only onesies or twosies squashed in spine-out. The big stores make much of their profit on tried-and-true backlist titles. Any older title that's being stocked in those sections you've no knowledge of (reference, car repair, but really, all sections)--the FACT that these books are there tells you that they WORK. While you're doing this, you can keep your eyes out for oddball titles that THEY seem to be selling in this quiet, behind-the-scenes way, but that YOU think you could make into specialty bestsellers in your store, merely by stocking these titles front and center. In other words -- if you took any bookstore you're familiar with, and completely rearranged the books, someone walking in would conclude they were in an entirely different store. 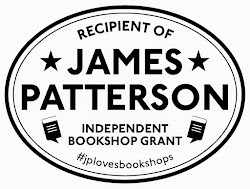 So by spying on the buying practices of other booksellers, you can learn what books they are relying on as their basic, key backlist inventory, and you can also think about how you'd utilize these books and categories entirely differently in your own store, to project a completely different shop identity. In the large stores, spies like us are generally unmolested, although sometimes we're kicked out. In small shops, it's impossible. It really is a form of intellectual theft. It's just that the big chains should be used by us indie bookstores for our own purposes. Spying on what amounts to their internal data (by watching what they rely on as chestnuts for reliable ongoing sale) is something we have a perfect right to do -- just as they would say they have a perfect right to do us to death. Another way to build up an inventory well beyond your personal knowledge and taste is to spend a lot of time browsing Amazon.com favorites lists posted by readers. In any given category, if you examine many favorites lists, you'll see certain titles popping up on lots of peoples' lists. If the category is obscure, these titles are surely ones no other bookstore stocks!! Yet -- here's evidence of what amounts to probably thousands of very strong titles that are also rather difficult to find. Finally, when spying on data in other peoples' stores, or online, I find that the absolute best books to keep an eye out for are those that are UNCATEGORIZEABLE. That is -- books in chainstores that stick out from their categories like sore thumbs. Such books may in fact not sell very well, and may end up being removed quickly from the store's inventory. But in a small store, the issue of dividing store category section-management among a group of staff-people doesn't come up, and there's no need to even HAVE all the "regular" categories. In a small store, weird books, that defy categorization, are in fact the absolute centerpiece of the store. They are hard to find, or to locate, in ordinary giant bookstores. But because they defy peoples' expectations about reality, people feel compelled to buy them. You must develop an inventory composed of titles that people have never heard of anywhere, but that they feel suddenly absolutely compelled to buy immediately. A panic must sweep over people when they're in your store. They must say, at the cash register: "I had decided I wasn't going to buy a book when I walked in the door, but look at this (gesturing at a big stack of books on the counter): I had no choice!" Go to Daunts, (strictly speaking, Daunt Books) in Marylebone High Street. 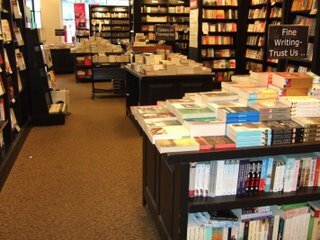 This is the sort of bookshop that should only be permitted to open between 3 and 3.30pm on alternate Thursdays - it's that addictive. Don't worry about the travel side but look at how they display their general books: it's a model to follow. 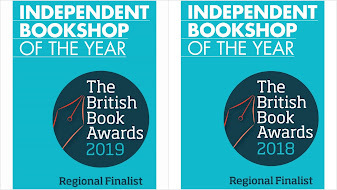 Being a small independent friendly bookshop, they might encourage your digicam... and you might even take one of them out to lunch at Patisserie Valerie and get a lot of useful advice. They're near Waitrose too: an auspicious location, evidently! [And occasionally, if one binges really heavily, one gets an elegant canvas carrier-bag that builds customer loyalty like nothing else]. If you're interested, I created a model inventory for the bookstore I helped open in Brooklyn recently. Vox Pop was aiming for a politically radical, unconventionally spiritual theme, with strong artistic/literary and self-sustainability undercurrents. They had about $20,000 to spend on inventory. I spent 8 weeks going through publisher catalogs, my own personal library, old store databases of previous projects, and Amazon favorites lists, as well as many publishers online catalogs. I organized the database I was accumulating by category names that seemed to be emerging from the list. 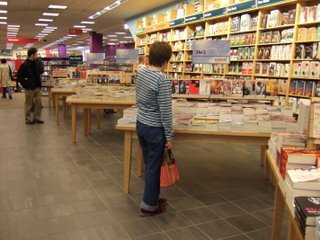 I tried to select only books that I felt fell into the category of those shouting to readers "YOU MUST BUY ME IMMEDIATELY". I came up with a list of 1,077 books. Of course, these are all titles that are available in the U.S. and such a list if created in Britain would surely be composed of different titles, have different publishers, different categories, etc. But -- if you'd like to look at it, I'll email you an Excel file. Give me an email address. By the way, to my astonishment and amusement (and bemusement), Sander and Holley down at Vox Pop did NOT actually utilize this booklist when they launched the store!! They have instead evolved their own booklist, based on experience with the actual customers! This proves that having a far-away buyer is a bad idea (which is why I think chainstores are in fact missing lots of potential sales since their central buyers aren't in the store listening to customers). So -- I don't know how my weirdo planned inventory for Vox Pop would in fact have done! It's a fun booklist though, I think. It contains practically no "standard" bookstore books. Andy, Joseph - many thanks for both these posts (Andy, I posted a response on Rebel Bookseller, but we have started an ambitious undercover operation to gather as much backroom-intelligence from the Oxford large bookstore triumverate). Joseph, I will definitely follow up with Daunt Books - I visited the website, and the whole building looks wonderful (the natural light thing works well for me, my background is in passive solar buildings, sadly not something we have control over in our grade II listed building). Canvas bags - gotcha. We were just finalising our bag design, and even if it's not ready by the time we open, it will soon after! I agree about Daunts and always head there first from Paddington on any London trip.The books are unusual and displayed in a very unintimidating way, small stacks on tables not teetering piles with more underneath the table.You tend to look and think, better get that there's only two, might sell out,won't see it anywhere else, not, oh there's 300 I'll come back. Canvas bags, yes indeed, even my buying one from Secession didn't help in the end but I love it. Now mugs,I hate to sound tacky but we can't be the only people with such poor taste that we'll buy them? Barter Books,Blackwells,the first page of Jane Eyre all grace our kitchen. Almost forgot journals, every book lover I know is on the look out for the perfect one and will buy twenty before they find it. Can you source your own rather than those characterless magnetic things? I'm sure all this has been mentioned before but just supposing it hadn't!